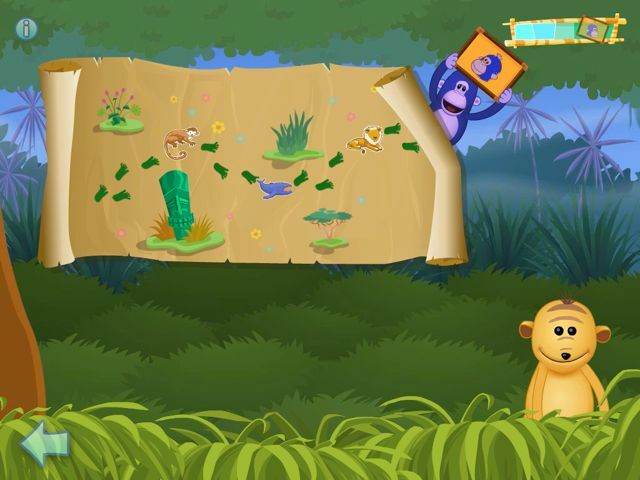 iLearn with the Mighty Jungle: Animals! is a limited app with limited appeal. But if you have a toddler of just the right age, you’ll probably get some decent use out of it. I wouldn’t hesitate to recommend it, at least for a test drive, at its current price (free!). But its current price is an extension of a limited-time offer and the value proposition won’t be nearly as attractive once this app moves back to its regular price of $2.99. Before checking out this app I had never heard of The Mighty Jungle, which is apparently a Canadian children’s television program that airs in the U.S. on PBS Kids. 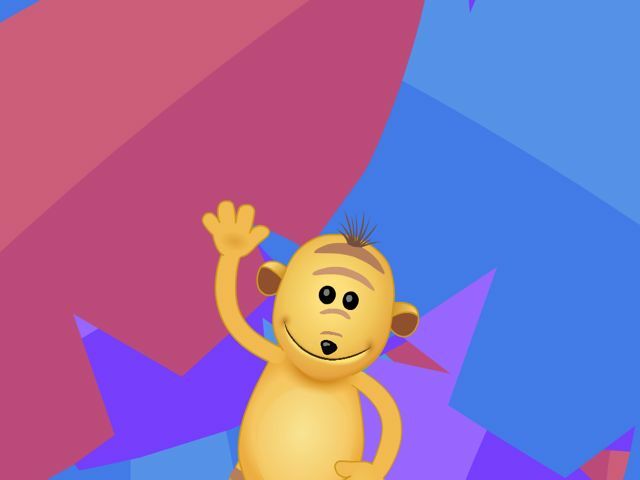 Since I haven’t seen the TV show I can’t say whether the characters or tone or settings in this educational app are faithful to the show, except to note that the app is entirely animated, while the characters on TV are puppets. As for the app, there’s not much to it. Beyond the title screen is a level select screen containing three levels, each ostensibly more difficult than the last. Actually there’s not much difference between the three levels aside from slight changes in the number and type of questions that are asked. Four pictures of animals are shown, and when the correct one is selected, another similar clue will be given. After three or four clues, the meerkat announces that you found Bruce and, sure enough, the corner of the map folds down and there he is. Actually, there is no finding of anything involved. After you’ve answered the questions correctly, the meerkat says you found Bruce, but he might just as well announce that, congratulations, you successfully invaded cuba or prepared a delicious soufflé. There truly is no reason to label this game hide-and-seek. 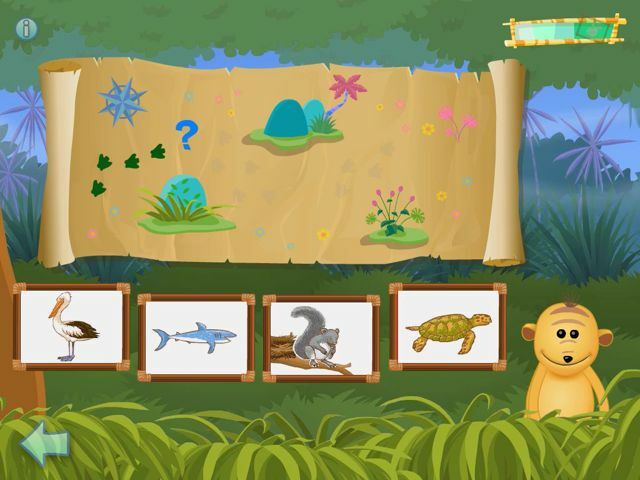 The art style of iLearn with the Mighty Jungle is heavily geared toward toddlers. Of course, artwork for a product meant to be used by toddlers should have artwork that is appealing to them. But this is no Muppets or Monsters, Inc. It is unlikely that anybody older than the target audience will find the characters in this app particularly appealing. For example, even if one happens to know what a meerkat is, I think it highly unlikely that there is a person alive who would identify that bulbous, orange, vaguely monkeyish character as a meerkat. 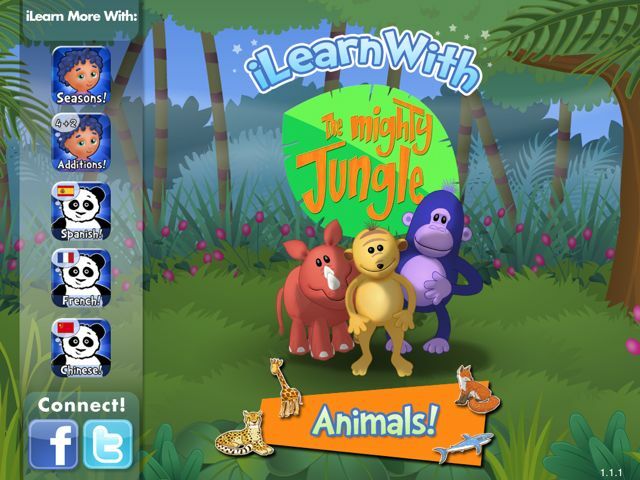 iLearn with the Mighty Jungle: Animals! opens with a short, but really catchy jingle. Aside from that there is no music in the app. Sound effects are sprinkled about here and there, but not liberally. What sound effects exist, are fairly well done, though. Where this game really shines is the voice-work recorded for the meerkat (I apologize for the continual lack of a proper noun–as far as I know this character never identifies himself). I assume, but am not sure, that the meerkat in the game is voiced by the same person who provides the voice for the TV show. Regardless, he is talented, and has a knack for engaging children. 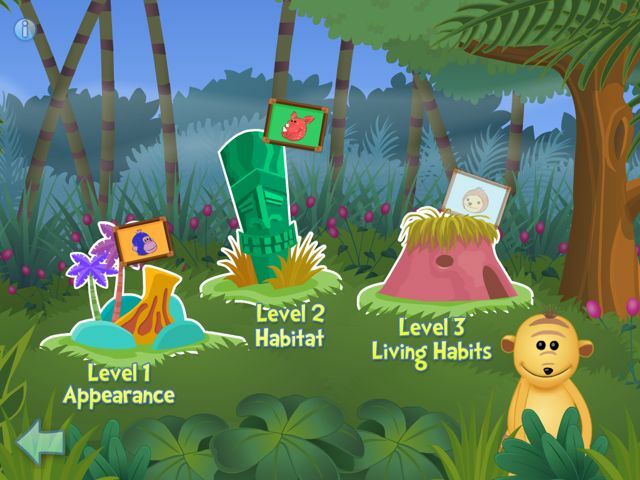 Gauging the effectiveness of iLearn with the Mighty Jungle: Animals! is tricky because I’m not entirely sure what Tribal Nova’s goals are. If the goal is to teach kids about animals, the method chosen is a decidedly indirect one. Children are never actively taught about the animals in this game. Rather, their knowledge about animals is continually tested. Granted, the answer to a clue is often contained within the animal choices–for example, the Meerkat might direct you to choose the animal who lives in cold climates, and one of the pictures shows a penguin surrounded by snow, while the others show animals surrounded by jungle or savannah scenes. Additionally, children can learn by sheer trial and error. If the task is to find the animal that has feathers, your child might eventually figure out that birds have feathers simply by repeatedly choosing incorrect options. But he only held up the picture for a few seconds. And try as I might, I could not find any place to access this picture. So not only is there not much of a reward given to the child for progressing, but what little reward they offer seems to be totally illusory. In addition, I found a couple of other small quirks with the app. On one occasion I was tasked with choosing the animal that has smooth skin. After making two “incorrect” choices, one of which was a piranha (which I suspect actually does have pretty smooth skin), the app then said that the correct answer was the shark. Coincidentally, I happen to have dissected a shark in my high school zoology class many years ago. Sharks, I assure you, do not have smooth skin. Sharks, as a matter of fact, often rub against potential prey to taste it, because a shark’s skin is so rough that it can make you bleed just by rubbing against you. In another instance, my daughter was shown three animals and tasked with finding the two that eat fish; three options were given: a blue whale, a piranha, and a shark. Probably you can immediately see the problem here, even if you never took a zoology class. My daughter selected the blue whale (correct!) and the shark (correct! ), at which point the supposedly incorrect answer (piranha) was eliminated. Of course, piranhas are omnivores and fish are a regular part of their diet. Fail. Luckily, most of the information being taught here is pretty obvious stuff, like that birds have feathers and fish have scales and crocodiles live in the jungle. So its unlikely that the app contains many of these errors. Still, by teaching the subject, Tribal Nova is holding itself out as an expert in the field–mistakes like this shouldn’t happen. This app is officially rated 4+. I personally think that’s silly. My 3 year old nephew is far more interested in it than my recently-turned-5 year old daughter. And between the two, only my nephew is challenged by the app. Both of the kids were initially interested in it, which speaks to the immediate appeal of the simple, bright art style and excellent voice work. But they didn’t last more than about ten minutes before becoming bored. There’s just not enough to do in this app to keep the kids attention for very long. You’ll have no problem sitting with your kids while they work their way through the trivia. The conservative use of sound effects, quality voice work, and lack of looping music add up to an experience that really isn’t very obnoxious. On the other hand, the tasks are intensely repetitive, so if your kid doesn’t get bored quickly, as my testers did, you will. This app is currently free. If you’ve got a 3 or 4 year old, go ahead and pick it up. Your kid will have some fun and might learn some basic animal trivia. Even at $0.99 I might give this one a cautious go-ahead. If Tribal Nova raises the price back to $2.99, though, save your money for something with a bit more substance.